Lewek and his five brothers and sisters were born to religious Jewish parents in the town of Kozienice, situated in east central Poland near a birch forest. Lewek's father owned a sawmill, and when Lewek and his brothers were grown, they helped their father manage the family business. 1933-39: When Lewek was 15 he attended an agricultural school near Kozienice, because he wanted to immigrate to Palestine [Aliyah] to work the land. But after the Nazis rose to power in Germany in 1933, immigration preference to Palestine was given to Jewish youths from Germany. Seeing he had no chance to leave, Lewek returned home to Kozienice, where he was trapped when the Germans invaded Poland in 1939. 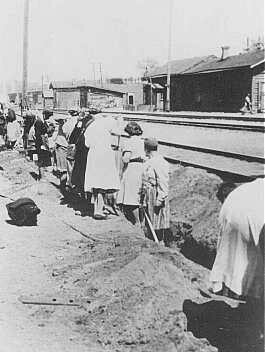 1940-44: The Germans set up a ghetto in Kozienice in late 1939, and by 1940, when Lewek was 26, he was deported to labor camps in Poland and Germany. He remembers that in the Allach labor camp he had a friend who saved his little bits of bread for the future. He finally got so weak doing this that he could not eat at all and died. Lewek was one of only a few survivors of an extended family of 200 people. He immigrated to the United States in 1949.